If you ask any entrepreneur what the most important part of a website is. They will undoubtedly tell you that it is the landing page. It’s an often quoted fact that you, as a business are not really competing with anything but the back button. And I can say from a lot of personal business experience that this is true. If your landing page doesn’t work. You won’t make money. Period. This fact often causes many to spend hours scrutinizing their landing pages, in an attempt to make it ‘perfect’. Without the right fundamentals this usually does not turn out well. The best landing pages follow a basic structure that informs the user efficiently and gets them to take action in the shortest possible time. This is the AIDA formula – which is attention, interest, desire and then action. The best sites use this formula in a variety of different ways but all of them seem to get it right for their own goals. Below is a compilation of the best bootstrapped startup landing pages that you can use to guide you in the making of your own landing page, they all (though in different spaces and with different conversion goals) follow a basic format that gets the user to take the action that they’d like them to take. Proof of their effectiveness is in their revenue performance (which I have also included in this post – based on estimates, from information that is freely available around the web). Note: Revenue numbers have been gathered by researching openly available information from around the web. For example, the Lynda.com revenue numbers are based on this Techcrunch article. Founded: 2008 by Amy Hoy and Thomas Fuchs of Slash7. 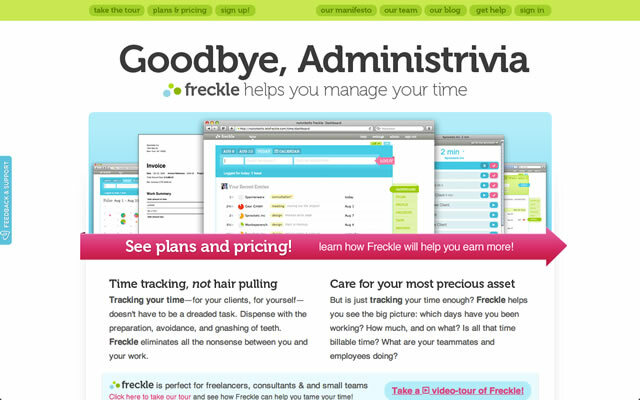 What They Do: Provide time tracking software to freelancers. Why is it their landing page so effective? These guys know their audience. The page is structured in a perfectly AIDA (remember that?) way, and more importantly the actual text on the page, speaks to the user in a casual and – unlike some of their competitors, fairly straightforward way. The content on the page is mainly geared towards getting you to care as soon as possible. They know that their audience is time conscious so this landing page makes sure that you know what’s going on within 10 seconds. Which is pretty useful for time tracking site! Because the faster you do, the more likely you are to actually take an action! Founded: 2009 by Peldi Guilizzoni. What They Do: Allow people to make mockups in an easy and friendly way. Estimated Revenue: $180,000 per month. 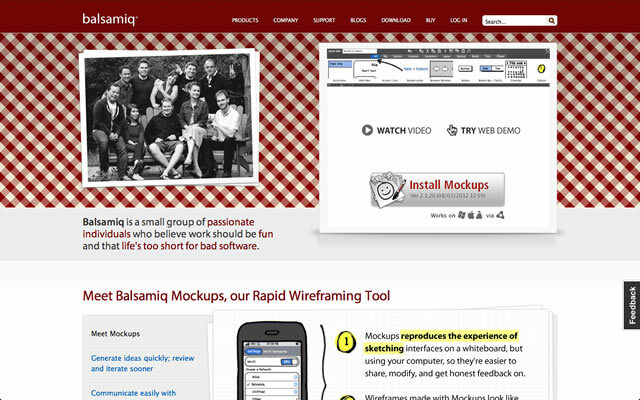 A lot of Balsamiq‘s appeal is in their image of being a ‘cafe down the road’ kind of service. You can really see that emphasized with the design elements that they use on their landing page. Like the table cloth pattern design behind the intro video and team picture at the top of the page. The feeling that these things exude, coupled with the amateur mockup elements used in the actual Balsamiq software, hit the nerve of the problem that they are trying to solve on a deep level. Mocking up is a creative process. And creativity needs a ‘cafe down the road environment/tool’ type of thing to help it along. What they have done is try to convey that as much as possible. And judging by their numbers. They’re succeeding and doing very well at it! Founded: 2001 by Ben Chestnut. What They Do: Provide email software. Estimated Revenue: $15,500,000 per month. This landing page focuses more on the I – interest and A – action parts of the AIDA formula than anything else. It is geared towards people who are coming in, probably already with an idea of what they want. 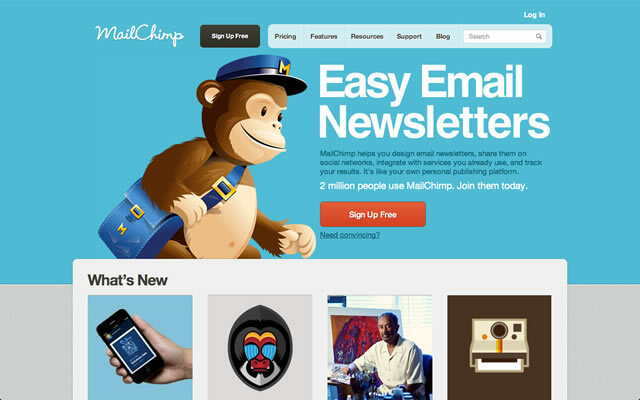 Mailchimp just tries to give it to them, while presenting themselves as the best possible choice for it, if you’re preference is what they offer -simplicity and design. They don’t go too heavy on trying to convince you about their product, but all the things that they need to tell you for you to take that first action are there. It seems frictionless yet very beneficial, and that is why I think that it gets a lot of signups and eventually paying customers. Founded: 2004 by Gwyn ap Harri. What They Do: Provide innovative learning environment software to schools in the UK. Estimated Revenue: $185,000 per month. These guys have a very unique type of customer – public institutions. Therefore the way that they present information differs slightly from your typical bootstrapped startup. The AIDA format is still followed. But it is done in a subtly different way. The content is geared more towards impressing the prospective customer than with directly telling them the exact problem that they are solving. This is because the process for selling to large organizations is a lot slower and often times you need to interact on the phone or face to face to close the deal. The key action for this site is a phone call. The impressing on this site is mainly done by showing the prospective client, case studies, who the partners of the site are, and showing the individual results that students and schools have had with real life videos. This adds a very personal touch that I am sure leads to many phone calls coming their way! Founded: 2009 by Adii Pienaar, Magnus Jepson and Mark Forrester. What They Do: Provide Custom WordPress Themes. Estimated Revenue: $250,000 per month. 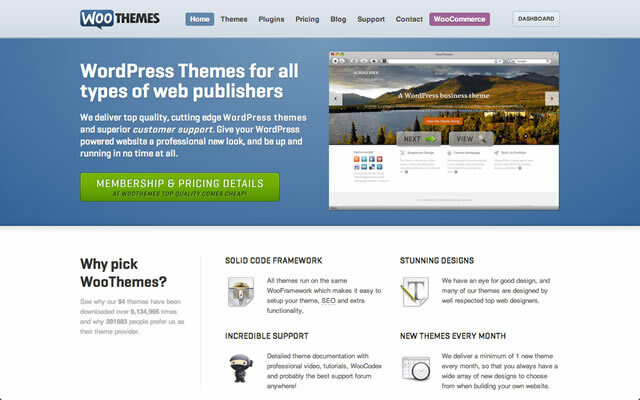 Woothemes by and large, let their themes do the talking on their landing page. Still following AIDA, they let you know the extra core information below the theme slideshow, but they know what their users are after. Great design and they do well to show this first. I believe that their core action is a click on the ‘view’ button for the template on the slideshow. Because once you get looking at the templates, with all of the interactivity that Woothemes provides, such as color changes, etc. The chances are much more likely, that you will eventually buy one. Founded: 1993 by Jeff Butterworth. 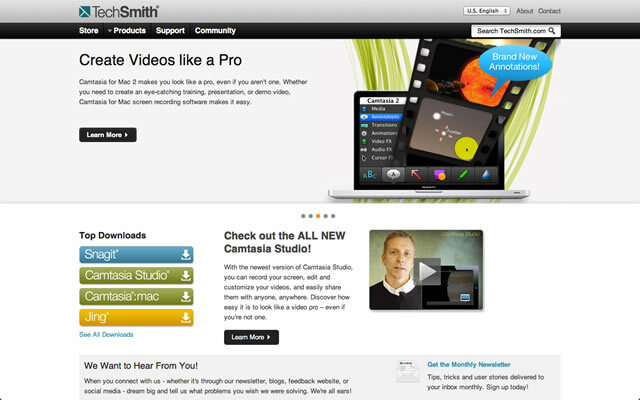 What They Do: Provide Photoshop Plugins for Photography and Graphic Design. Estimated Revenue: $295,000 per month. This landing page mainly focuses on using credibility to capture user interest. 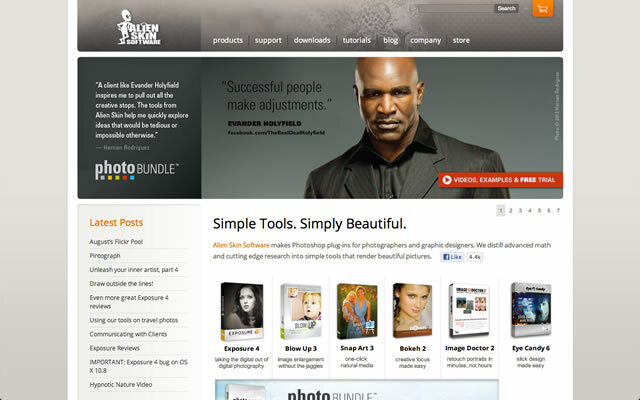 With celebrities like Evander Holyfield on the homepage, it gives the products more desirability, though not much is said about them individually. This is pretty fitting as the company behind has been around for a while so has the credibility tool in their toolbox. That is where the effectiveness of it comes from. Founded: 2006 by Collis Ta’eed. 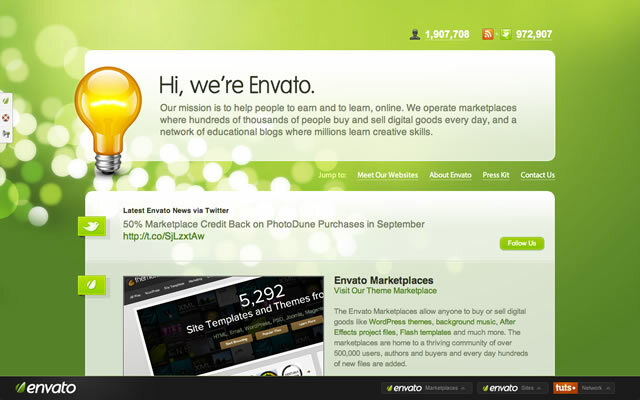 What They Do: Envato creates websites that help people earn income. Mainly geared towards the web, graphic design space. Estimated Revenue: $710,000 per month. This landing page is slightly different from the others as its mainly geared towards being a showcase for the various websites that the company makes. That said there is still a goal here of getting you to visit the sites as well as a secondary goal of getting you to understand what the company is about and stands for as a brand. They do this by presenting a short bio at the top that conveys their mission statement and this is further added to with their actual sites. Which each have descriptions that are very informative. The landing page definitely succeeds in making you want to visit the sites and engage. Founded: 2005 by Paul Farnell, Matthew Brindley and David Smalley. 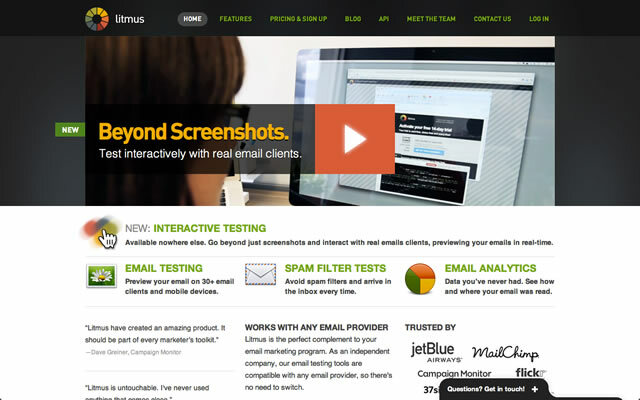 What They Do: Litmus allow you to test your emails in a variety of different clients on just one computer. Estimated Revenue: $3,300,000 per month. My belief is that using a video on a landing page is like the equivalent of using the ‘signature move’ in a classic fighting game. It wins. All the time. And not only does this site give you a great video, that conveys the information well (again, AIDA) but it also exhaustively, but not lengthily, gives you all the information you need about the services that the company offers to make a decision. Founded: 1987 by Bill Hamilton. What They Do: They make screencasting tools, including screen capture, recording and editing software, for Microsoft Windows and Mac OS such as Camtasia and Snagit. Estimated Revenue: $2,833,000 per month. This landing page keeps it simple. Standard AIDA flow, but with an emphasis on getting you to ‘learn more’, instead of taking a direct action upfront. The products that they sell are quite pricey, so they have definitely adopted a slower approach to their conversion funnel. Judging by the numbers, not to mention the number of years that this company has been around, this is working pretty well! Founded: 2004 by Brian Parish. 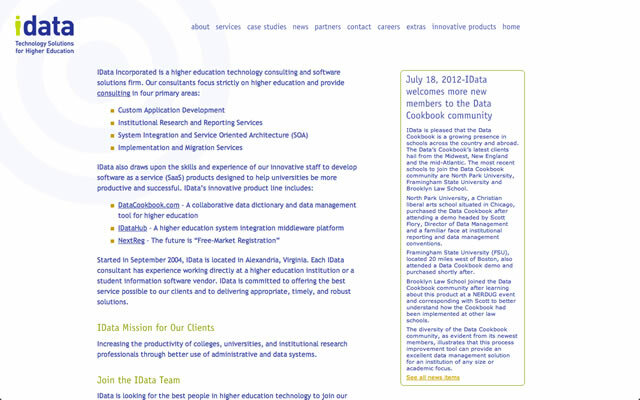 What They Do: Provide technology solutions to higher education in the US. Estimated Revenue: $200,000 per month. 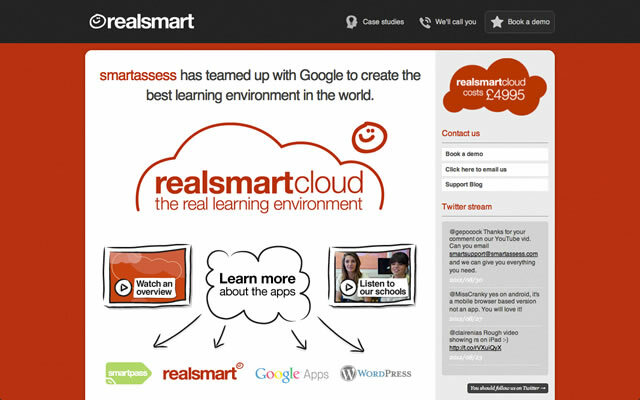 This is another company’s website, that sells to higher education institutions but it seems to have a different take on it than realsmart does. It simply displays the textual information needed for clients to oversee and understand what the business is about. There are two reasons why I think this is done and. One is to make the clients feel comfortable, by not having a too over the top website (this is pretty similar to a lot of institutional web pages). And two, is that this site is more of a reference point, to add to the client sale process – and ultimately supplements the sale process for the business. Founded: 1995 by Lynda Weinman and Bruce Heavin. 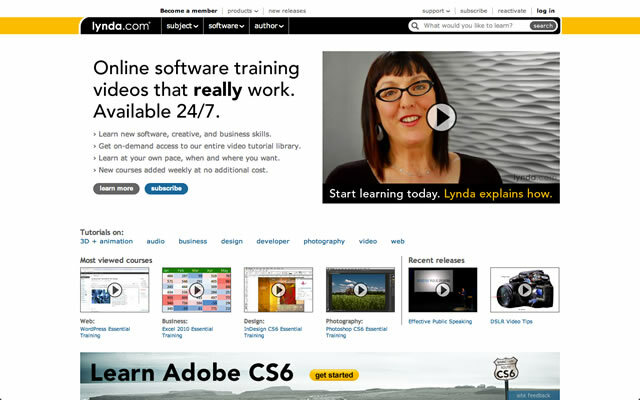 What They Do: Lynda produces educational courses for creative people in a variety of fields. Estimated Revenue: $6,700,000 per month. This page is another case of a business that really understands its customers. The headline users the “videos that REALLY work”, with an emphasis on ‘really’. This, from the fact that most video tutorials are poorly done and can at times be ineffective at allowing the user to retain information. This is a core point being addressed very early on. Which would grab the target user, who is undoubtedly very familiar with this issue. They also put their videos at the forefront (with free, no login required viewing), which encourages users to engage with the site immediately, increasing Lynda.com’s chances of conversion significantly. Founded: 2004 by Dan Clifford and Amy Buckner. 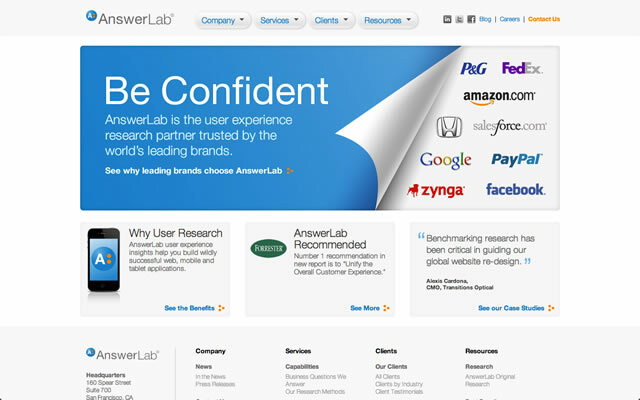 What They Do: Provide customer insights to the leading brands around the world. Estimated Revenue: $300,000 per month. This landing page is the near perfect template for how to make a landing page that sells to enterprise clients. Again, here like the educational startups pages, they focus on impressing the prospective user, rather than explicitly stating the problem being solved and driving toward a specific action. The page overall is a lot more vague, and geared towards getting the viewer to want to know more. Perfect for enterprise clients. Founded: 2004 by Eddie Machaalani and Mitchell Harper. 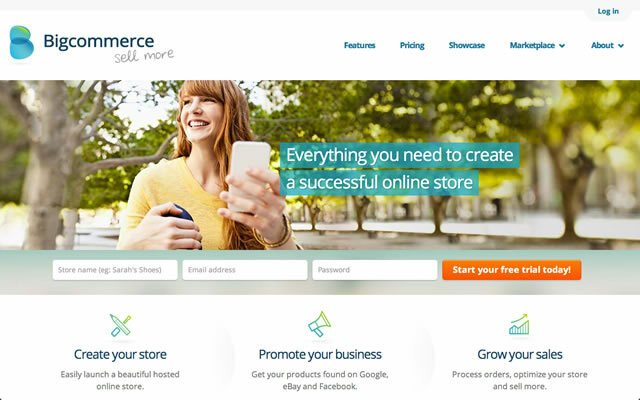 What They Do: BigCommerce are an online store service. Similar to Shopify. They make it easy to create and run your online store. Estimated Revenue: $1,080,000 per month. This is your classic online squeeze page. The only difference in this case is that this particular one is responsible for generating over $20m in annual revenue! This page is focused on giving you just enough information, then combining that with a frictionless signup process, to maximize the page conversion rate. My guess is that the users that land on this page have been pre-sold in a way, via ad copy or seo meta descriptions. So they know what they’re after and are the right kind of customer. Which makes the conversion rate even higher. Founded: 2009 by Paras Chopra. 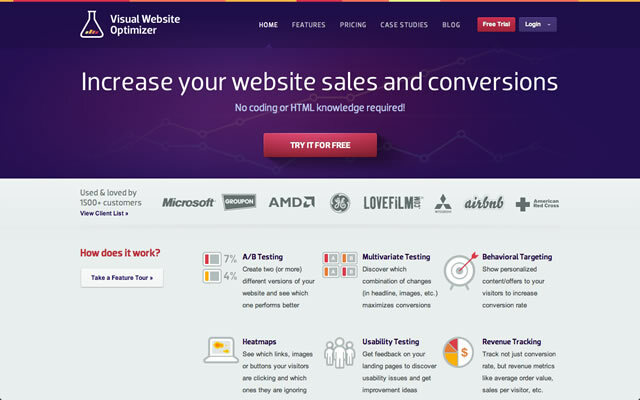 What They Do: Provide a tool that allows websites to test the split test pages on their site. Estimated Revenue: $100,000 per month. This lander is somewhere in the middle of a squeeze page and your standard lander. I can imagine – what with the nature of the parent site/business that the page changes quite often, but as this is the one that I have seen most often. I can pretty safely assume that it is the best performing one. The page differs slightly from your average landing page AIDA format as it is very heavy on education of the problem and service. This is because it operates in a space that it still relatively new. Mutli-Variate Testing. This quick shot education, along with the free trail – likely converts very well. Founded: 2005 by Pete Cashmore. 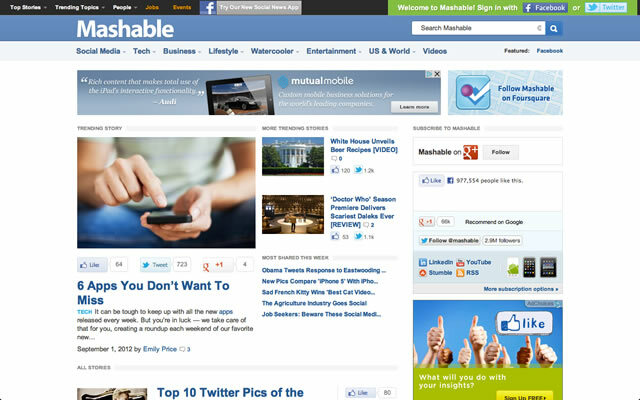 What They Do: Mashable are a social news site/blog with an emphasis on startups. Estimated Revenue: $500,000 per month. With this, we are entering into slightly newer territory as this is primarily a news site and therefore has a lot of information on one page. It is the way that the information is presented though, that makes this an effective landing page. There are a number of actions that the site wants you to take but the most important is the clicking onto the articles, therefore the most noticeable things on the page are the article titles. This is done with a clever use of spacing and typography. Founded: 2007 by Bryan Johnson. 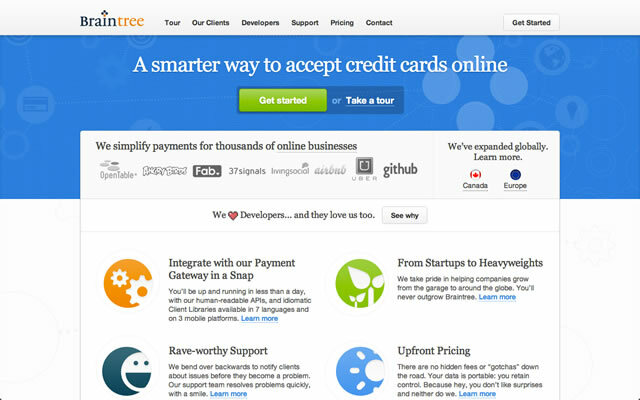 What They Do: Provides an easy way to accept credit cards online. This lander is as AIDA as you can get. Almost down to a tee. Starting with the simple, but very informative headline that grabs your attention and continuing on down, while continually building up your desire to use their product. What is slightly different about this page though, is that they emphasize the building of desire first, before leading onto to the additional information. This is an emerging trend in modern web design. Where previously, appealing to emotions was not as necessary. Probably because most web businesses previously were supported by ads and not the user directly. Founded: 1999 by Jason Fried (Later partnered by David Hainermeier Hansson). 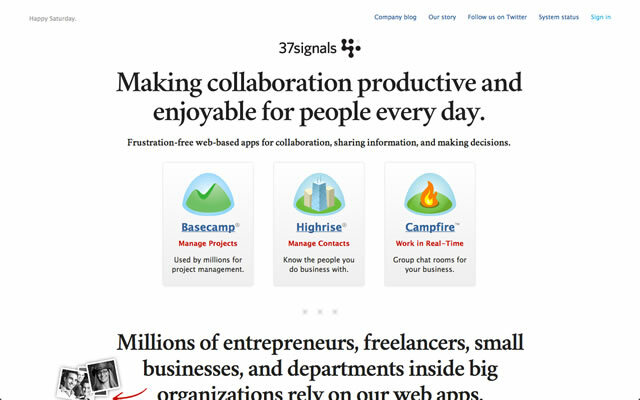 What They Do: Provide simple productivity software to small businesses. Estimated Revenue: $5,000,000 per month. This lander is the epitome of minimalism in web design. It does everything that it intends to do, with as little as is needed to do it. The main goal of this page is to get you to check out their individual products. This is mostly done by appealing to the D in the AIDA formula, the desire. By showing the user a lot of credibility boosting information, they are propelled towards the product and would want to check it out. Founded: 2008 by Vishal Kapur and Jahanzeb Sherwani. What They Do: Provide a simple way to control your computer remotely from anywhere in the world. iTeleports message is very clear. 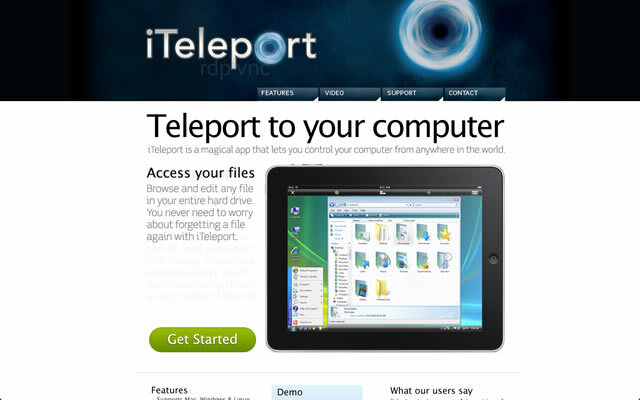 ‘Teleport to your computer’. This is a great headline. Straight to the point and tells the user immediately what the app is about. The page itself, again follows the standard AIDA format, with the end goal being a click on the ‘get started’ button. They do not need to do much more as their product solves a pain-point so well, that just sharing the basics, as is done here – does most of the hard work for you. Founded: 2009 by Dane Maxwell. 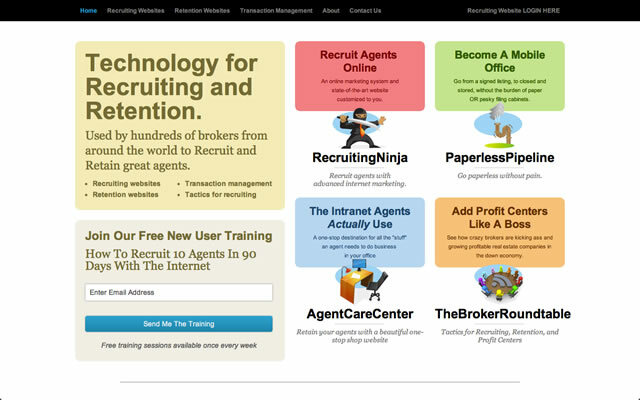 What They Do: Provide simple tools for realtors that makes their work easier to do. Estimated Revenue: $60,000 per month. The real world equivalent of this landing page, would be a shopping centre. Except in this case – the owner of the individual businesses is also the owner of the shopping centre. The target customer is shown complimentary products in a simple fashion, that in my opinion, transfers customers from one service to another. And for new customers, possibly increases their rate of conversion as they will likely find SOMETHING that they need from this site – from the choice of services.